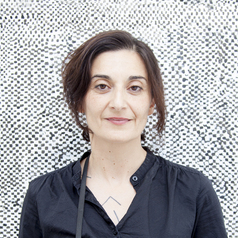 Cherine Fahd is an artist, academic and writer working in the field of photography. Fahd’s extensive exhibition history has seen her work shown in major public institutions in Australia and internationally. Her work is represented in public collections such as the National Gallery of Australia, Art Gallery of New South Wales, National Gallery of Victoria, Museum of Photographic Arts San Diego and the Haifa Museum of Art, Israel. She has been the recipient of numerous Grants from the Australia Council (2018, 2016, 2014, 2007, 2004, 2002, 1999) along with art awards and residencies such as the NSW Women & Arts Fellowship from Arts NSW (2005), Josephine Ulrick and Win Schubert Foundation for the Arts Photography Award (2004), National Photography Prize (2010) and the Moya Dyring Studio from the Art Gallery of New South Wales (2003). In 2018 she was awarded the Asialink Creative Exchange residency to Varanasi, India. In 2019 she was selected for The National: New Australian Art and awarded a residency at The Clothing Store, both at Carriageworks. Fahd holds a doctorate (PhD) from Monash University, Melbourne and is the Director of Photography at the University of Technology Sydney.